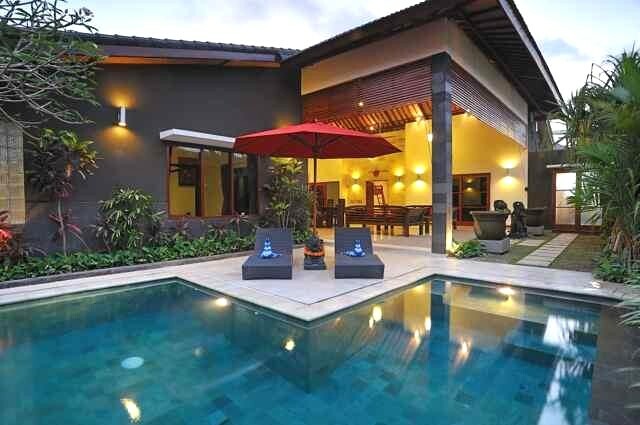 The Pulau Villas Bali is conveniently located in the city of Umalas, Kerobokan, just 5 minutes by car from Seminyak. Pulau Villas Bali features spacious and comfortable accommodations with modern amenities and friendly Balinese hospitality. 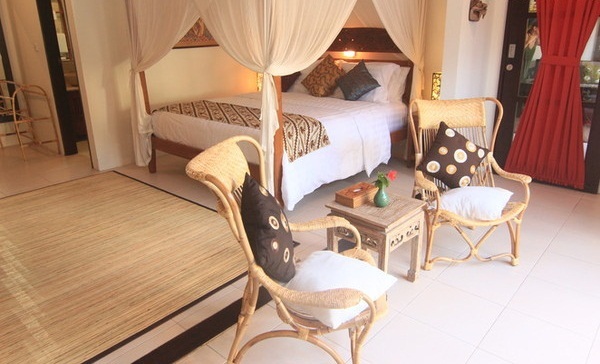 The hotel has 3 guest villas in 3 bedroom, 4 bedroom, and 6 bedroom formats, featuring tasteful and contemporary decor. Each villa comes equipped with a private pool, kitchen, TV, and available movies. Guests of the hotel will enjoy the picturesque scenery and natural beauty surrounding the property. 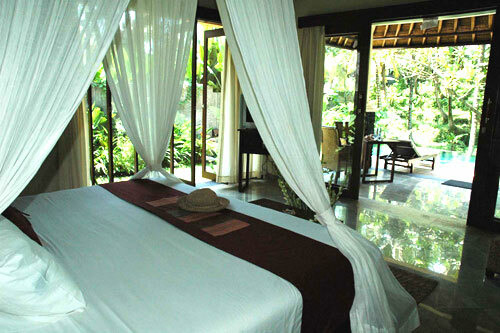 Pulau Villas Bali is the perfect place to stay for guests looking for a superior accommodation and quality service. Pulau Villas Bali in Bali! The Cabe Bali Hotel is located 20 km Northeast of the seaside town of Candi Dasa, near Tirtagangga. Cabe Bali Hotel has 4 bright and spacious guest rooms featuring a peaceful atmosphere and elegant yet simple decor. Each room offers tiled floor, comfortable bed, private bathroom, sitting area, free Wi-Fi access, and beautiful views of the tropical gardens. Guests will enjoy the many facilities and services offered by the hotel, including an outdoor swimming pool, kids pool, massage service, safety deposit boxes, and laundry service. The hotel also features an airport shuttle and laundry service for guest convenience. The Cabe Bali Hotel has an on-site restaurant serving delicious regional cuisine. Cabe Bali Hotel in Bali! 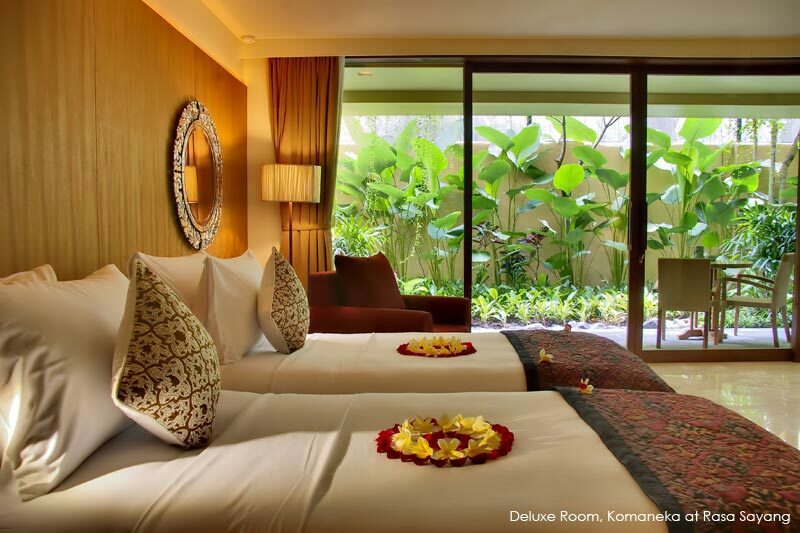 The Komaneka at Rasa Sayang Ubud Hotel is conveniently located in the tourism and cultural hot bed of Bali City. With a number of spas, restaurants, and attractions nearby, including Komaneka Gallery, Monkey Forest Ubud, and Ubud Market, the hotel is the perfect place to stay for a well-deserved break. Komaneka at Rasa Sayang Ubud Hotel has 32 comfortable and spacious guest rooms featuring tasteful furnishings and contemporary decor. 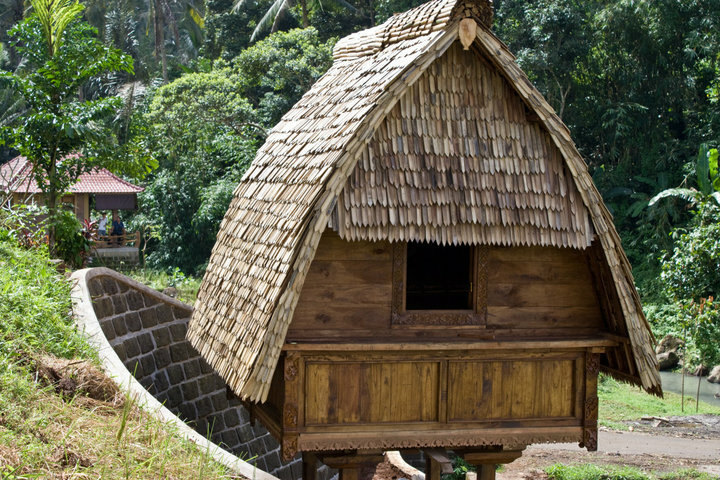 The Komaneka at Rasa Sayang Ubud Hotel features a wide variety of amenities for guests to enjoy. The on-site restaurant serves a variety of international and regional cuisine, and 24-hour room service is available. The hotel also offers a complimentary airport shuttle for guest convenience. Komaneka at Rasa Sayang Ubud Hotel in Bali! 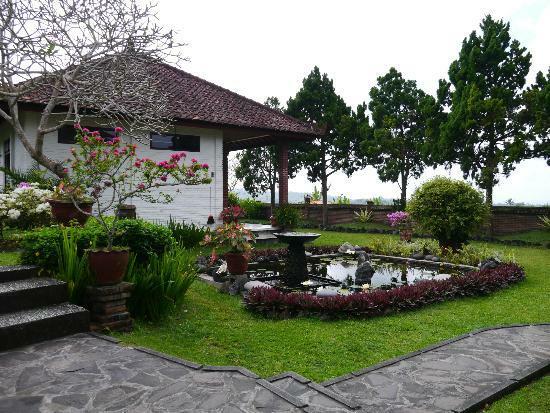 The Villa Saraswati is located in the town of Ubud, just 4 km from the center of town. The hotel is near the town's major attractions for guests who wish to experience all the area has to offer, and is 55 minutes by car from the airport. Villa Saraswati has 5 comfortable and spacious guest rooms featuring tiled floors and simple yet elegant decor. 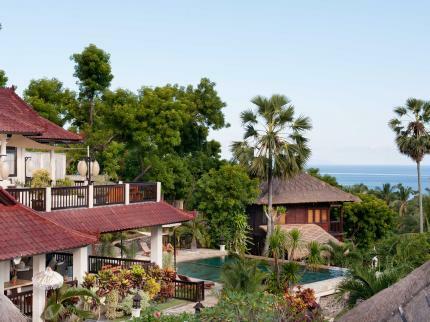 Villa Saraswati has an age limit policy that only allows guests of 18 years of age or older to stay at the hotel. The hotel also offers an airport transport, shuttle service to local sites, tours of landmarks and attractions, and available bicycle rental for guests who want to explore the area. The 5-star Kajane Mua Villas is located in the heart of the cultural and artistic center of Ubud, with access to a wide variety of restaurants and shops. The hotel is also situated 45 km from the airport. Kajane Mua Villas has 8 individual guest villas featuring elegant Balinese décor and locally crafted furnishings. Each luxurious villa comes equipped with a beautiful private bathroom, tiled floor, and large windows with scenic views. Guests of Kajane Mua Villas are encouraged to take advantage of the hotel's excellent services and modern amenities. Kajane Mua Villas features an on-site restaurant, serving gourmet regional and international cuisine. Kajane Mua Villas in Bali! The Palms Ceningan Hotel is located on the waterfront on the island of Nusa Ceningan, with spectacular views of the ocean. The hotel is situated 16 km from the center of town, and 17 km from the airport. The Palms Ceningan Hotel has 4 individual wood bungalows featuring tiled floors and simple yet elegant Balinese-inspired decor. The hotel also features babysitting service, shuttle to local sites, bicycle rental, and available water sports activities. The Palms Ceningan Hotel has an on-site restaurant serving regional cuisine, a coffee shop, and full-service bar where guests can get a variety of beverages and cocktails. The Palms Ceningan Hotel in Bali! The Hotel KajaNe Tulamben is located on a beautiful stretch of waterfront in the village of Tulamben, 19 km from the town center. The hotel is also situated 97 km from the airport. Hotel KajaNe Tulamben has 8 spacious and comfortable guest rooms featuring hardwood floors and picturesque views of the beach and ocean. Each bright room comes equipped with a variety of modern amenities, including internet access, private bathroom, refrigerator, and plush bathrobes. The hotel also offers concierge service, bicycle rental, guided tours of the area, and an airport transfer shuttle for guest convenience and enjoyment. Hotel Kajane Tulamben in Bali! The Bali Eco Stay is located in a remote mountain paradise on the island of Bali, 60 minutes by car from the capital city of Denpasar. The hotel has 4 bright and spacious guest bungalows: two 2-bedroom, 2-bathroom units; and 2 one-bedroom, one-bathroom units. Bungalows feature naturally elegant decor and traditional Indonesian accents with hardwood floors and stunning views of the tropical surroundings. Each guest accommodation comes equipped with 1 or 2 private bathrooms with natural soaps and hot showers. Bali Eco Stay offers guests a number of activities to take part in, including rice paddy walks, car and bike tours, swimming in natural rock pools, massage services, and a variety of workshops and classes for children and adults. Bali Eco Stay in Bali! 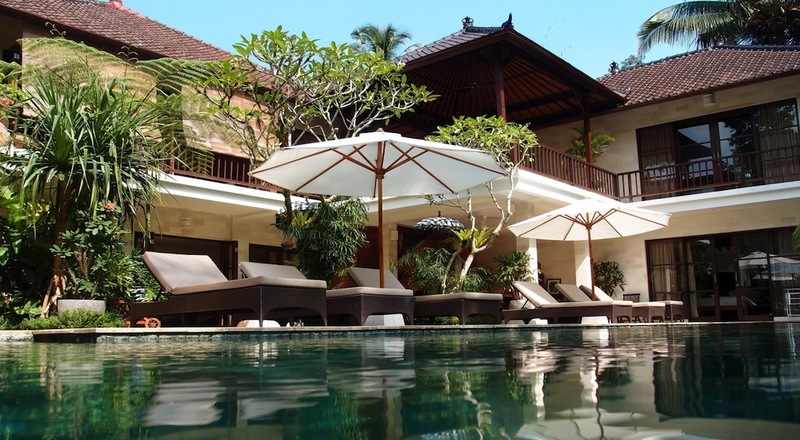 The Kembali Lagi Guest House is conveniently located in Sanur, on the beautiful island of Bali. From this modern hotel, guests have access to the city's best attractions and a wide variety of restaurants and shops. The hotel is also near the Consulates for many foreign nations, including France, Hungary, and Germany. Kembali Lagi Guest House has 8 comfortable and quiet guest rooms featuring modern amenities and a relaxing atmosphere. Guests are welcome to enjoy the hotel's many features, including a scenic tropical garden, outdoor swimming pool, safety deposit boxes, and free private parking. The hotel also offers an airport shuttle and babysitting services for guest convenience. Kembali Lagi Guesthouse in Bali! 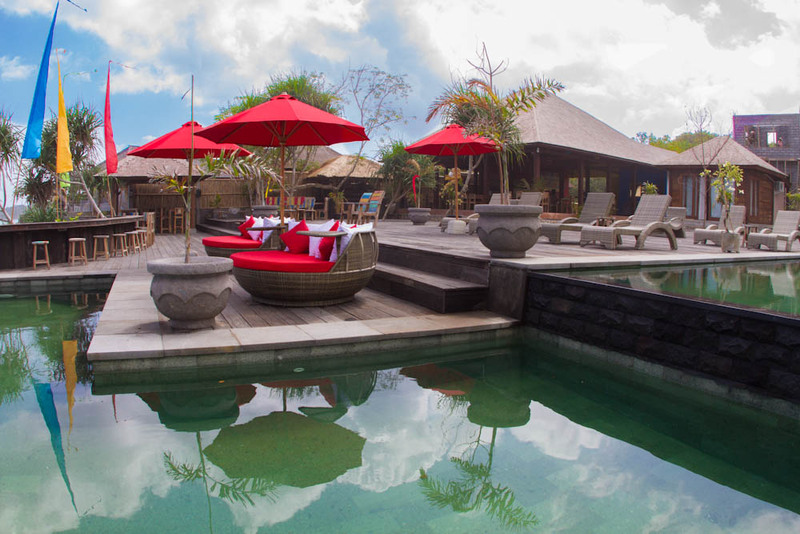 The Villa Flow is located in a beautiful waterfront setting in the town of Candi Dasa, on the island of Bali. The hotel is situated perfectly for guests who wish to explore the city's many attractions and the island as a whole, and is only 70 km from the airport. Villa Flow has 5 spacious and comfortable guest rooms or villas featuring breathtaking views of the tropical rainforest and mountains. Each non-smoking room comes equipped with a private bathroom with shower, TV with DVD player, and mini bar. Villa Flow features a number of amenities for guests to enjoy, including a private beach, spa with massage and beauty treatments, lush tropical gardens, and an outdoor infinity pool.